Dog separation anxiety is very common. Being alone is something we all must learn. For dogs, this can be even more challenging. Dogs are wired to keep close to family, seeking safety in numbers. Being alone doesn’t come naturally. Furthermore, dogs have the brain power equivalent to a toddler. When you leave the house, to your dog you are simply gone! What exactly is Dog separation anxiety? Spying is the best way to know how your dog is coping with aloneness. Video via smartphone is frequently the easiest option. If you want to go for something fancy check out the Furbo dog camera. Easy does it. When you bring your puppy home, the first time you leave them will be their first experience with aloneness. Keep the first separations short and gradually increase over time. Everybody needs a safe place. A safe place is a sanctuary your dog can go to when they are feeling worried or tired. It is a healing place. To introduce a safe place look here. What about the older dog with separation anxiety? 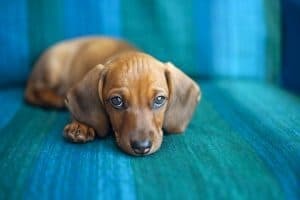 If your dog hasn’t been coping with being alone for a while then a veterinary behaviourist is the expert uniquely skilled to get your furbaby back on track.